حسینی, هلن, شفیع پور, رضا, عمادی, مهدی. (1396). تدوین الگوی گزینش مربیان تیم‌های فوتبال لیگ برتر کشور ایران. 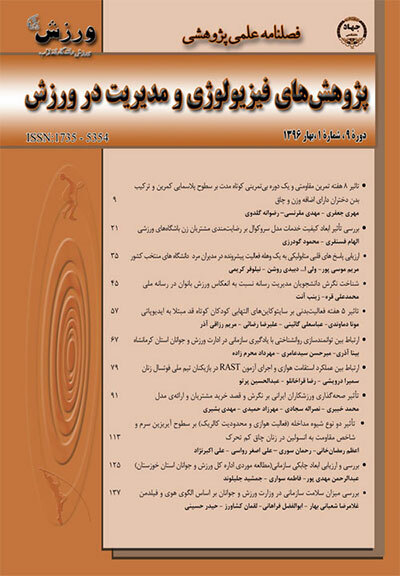 پژوهش های فیزیولوژی و مدیریت در ورزش, 9(4), 55-68. هلن حسینی; رضا شفیع پور; مهدی عمادی. "تدوین الگوی گزینش مربیان تیم‌های فوتبال لیگ برتر کشور ایران". پژوهش های فیزیولوژی و مدیریت در ورزش, 9, 4, 1396, 55-68. حسینی, هلن, شفیع پور, رضا, عمادی, مهدی. (1396). 'تدوین الگوی گزینش مربیان تیم‌های فوتبال لیگ برتر کشور ایران', پژوهش های فیزیولوژی و مدیریت در ورزش, 9(4), pp. 55-68. حسینی, هلن, شفیع پور, رضا, عمادی, مهدی. تدوین الگوی گزینش مربیان تیم‌های فوتبال لیگ برتر کشور ایران. پژوهش های فیزیولوژی و مدیریت در ورزش, 1396; 9(4): 55-68. تحقیق حاضر با هدف تدوین الگوی گزینش مربیان تیم‌های فوتبال لیگ برتر کشور ایران طراحی و اجرا شده است. روش تحقیق، پیمایشی و جامعۀ آماری آن با توجه به اهداف تحقیق شامل مربیان نخبه، بازیکنان نخبه، مدیران، استادان دانشگاهی و کارشناسان متخصص در زمینۀ فوتبال است. به‌علت نبود اطلاعات مشخص در مورد تعداد کل جامعۀ آماری و براساس فرمول حجم نمونۀ کوکران در شرایطی که جامعه مشخص نباشد، 384 نفر به‌عنوان نمونۀ تحقیق مشخص شدند. ابزار تحقیق پرسشنامه‌ای محقق‌ساخته براساس مطالعۀ جامع منابع بود که روایی و پایایی آن با استفاده از روش‌های رایج ارزیابی شد. به‌منظور تجزیه‌وتحلیل یافته‌های تحقیق از آزمون تحلیل عاملی و همچنین آزمون تحلیل مسیر از طریق نرم‌افزارهای آماری SPSS و AMOS استفاده شد. یافته‌ها نشان داد که در مجموع 298/86 درصد از کل واریانس‌ها شامل چهار دسته ویژگی است. نتایج تحقیق نشان داد که برخورداری از ویژگی‌های ارتباطی-اجتماعی با تأثیر 528/0 بیشترین اثر را بر انتخاب اصلح‌تر مربیان لیگ برتر فوتبال ایران دارد. This study was designed to codify a model of coach selection in Iran premier league football teams. The method of this study was survey and the population included elite coaches, elite players, managers, university professors and football experts considering the study aims. Due to the lack of specific information about the total number of population and based on Cochran sample volume formula, when the population is not known, 384 subjects were selected as the sample. A researcher-made questionnaire based on a comprehensive review of literature was used to collect data. Its validity and reliability were assessed by common methods. For data analysis, factor analysis and path analysis by SPSS and AMOS software were used. The results showed that 4 factors explained 86.298% of the total variance. Also, the results showed that enjoyment of communication-social property (impact=0.528) had the highest effect on better selection of coaches in Iran football premier league. آرمسترانگ، مایکل (1982). مدیریتعملکردراهبردیکلیدیوراهنمایعملی، ترجمۀ دکتر سعید صفری، امیر وهابیان، انتشارات جهاد دانشگاهی واحد تهران، ص 57-52. ابراهیم‌زاده، محمدنقی؛ اسدی، حسن؛ حمیدی، مهرزاد؛ سعیدآذری، زهرا (1391). «طراحی و تدوین معیارهای انتخاب تیم‌های ملی شطرنج»، نشریۀ مدیریت ورزشی، قبول برای چاپ. اسماعیلی، محسن؛ طالب‌پور، مهدی (1386).«بررسیاولویت‌بندیوارزشیابیابعادمربیگریدرتیم‌هایورزشیدانشگاه‌های کشور»، فصلنامۀ پژوهش در علوم ورزشی، ش 16، ص 106-92. افضل‌پور، محمد اسماعیل؛ قراخانلو، رضا؛ خداداد، احمد (1383). «ارزشیابی نقش مربیان خارجی در موفقیت تیم‌های ملی و باشگاهی فوتبال ایران»، فصلنامۀ المپیک، ش 27، ص 71-51. تبریزی، رضا (1381). «اولویت‌بندی بعضی از ویژگی‌های مربیان از دیدگاه مربیان و کشتی‌گیران سطح ملی کشور»، نشریۀ حرکت، ش 11، ص 131-119. شفیعی، محسن؛ گودرزی، محمود؛ حمیدی، مهرزاد؛ یدالهی، جهانگیر (1386)، طراحیوتبیینمعیارهایانتخابمربیانتیم‌هایملیشنا،شیرجهوواترپلو از دیدگاه مربیان این رشته»، نشریۀ حرکت، ش 32، ص 36-19. کهندل، مهدی؛ امیرتاش، علی‌محمد؛ مظفری، امیراحمد (1381). «تعیین و اولویت‌بندی معیارهای انتخاب مربیان تیم‌های ملی در چند ورزش گروهی»، فصلنامۀ المپیک، ش 21، ص 28-18. نصیری، خسرو؛ خبیری، محمد؛ سجادی، نصراله؛ کاظم‌نژاد، انوشیروان (1388). تحلیل و مدل‌سازی ارزیابی مربیان تیم‌های ملی هندبال ایران، نشریۀ مدیریت ورزشی، ش 1، ص 140-120. 13. Chen M.(2007), Exploring The Relationship between Effective Coaching Leadership, Group cohesion, and Achievement motivation in college Basketball Team in Taiwan. theses for the degree of Doctor of Recreation and tourism :Ohio state university,USA. Chu D.R, Tingzon R.J. (2009). The Relationship of Coaching Competency on the Athlete’s Self-efficacy and Hope.The International Journal of Research and Review ;(1): 84-121. Dubrin, A.J. (2001), leadership, research findings, practice & Skills, Houghton, Mifflin company, Boston, 48-49. Gillham, A. (2009). Going beyond won-loss record to identify competent coaches: development of the coaching success questionnaire. Dissertation of university of Idaho, 9-10. Hampson, H; Jowett, S;(2012), Effects of coach leadership and coach–athlete relationship on collective efficacy, Scandinavian journal of medicine & science in sports, doi: 10.1111/j.1600-0838.2012.01527.x, 15-24. Heidary A, Emami A, Eskanaripour S, Saiah A, Yarmohamadi S, Shahbazi M.(2011).The relationship between leadership style coaches and athletes` performance in soccer and basketball teams In Zanjan-Iran. Procedia - Social and Behavioral Sciences; 30: 2408– 2409. Jones, G;(2002), performance excellence: A personal perspective on the link between sport and business, Journal of applied sport psychology,(14), 268-281. Lafreniere M.A.K , Jowett S , Vallerand R. J, Carbonneau N.(2011). Passion for coaching and the quality of the coach- athlete relationship: The mediating role of coaching behaviors. Psychology of Sport and Exercise;12(2):144-152. Martens R. (2004).Successful coaching (Third edition ed. ): Human kinetic, 25-26. Mallett, C. (2006). Beyond Winning and Losing: Guidelines for Evaluating High Performance Coaches. The Sport Psychologist, 2006, 20, 213-221. Myers, N.D; Vargas-Tonsing, T.M., Feltz, D.L.,(2005), Coaching efficacy in intercollegiate coaches: sources, coaching behavior, and team variables, Psychology of Sport & Exercise,(6), 129–143. Stewart, Meyers. (2004). Investigate motivational characteristics of the young players if age and position impacted those traits, Physical Eductioan. P:61-78. Vute, R. (2005), Self-perception of national team coaches in volleyball for the disabled, Acta Univ. Palacki. Olomuc Gymn. 2005, vol. 35,(1), 69-77. Weinberg, R.S. ; Gould, D.(2003), foundations of sport and exercise psychology, (3rd ed), Human kinetics, champaign, IL, lliois, 24-26. Weinberg, R.S. , McDermott, M, (2002), a comparative analysis of sport and business organizations: factors perceived critical for organizational success, journal of applied sport psychology,(14), 282-298. Horn ,T.S.,(2002), Coaching effectiveness in the sport domain, Advances in sport psychology. Champaign, IL: Human Kinetics, 309–354. Marback, T.L., Short, M.W., Short, S.E., Sullivan, P.J. (2005). Coaching confidence: An exploratory investigation of sources and gender differences. Journal of Sport Behavior, 28, 18–34. Myers, N.D., Wolfe, E.W., Maier, K.S., Feltz, D.L., Reckase, M.D. (2006). Extending validity evidence for multidimensional measures of coaching competency, Research Quarterly for Exercise and Sport, 77, 451–563. Sullivan, P.J., & Kent, A. (2003). Coaching efficacy as a predictor of leadership style in intercollegiate athletics. Journal of Applied Sport Psychology, 15, 1–11.